Overall, The Guns Above was a fun military science fiction story set in a world more akin to steampunk than the usual space battles I associate more closely with the genre. The battles were intense, the characters engaging, and the world interesting if not quite as defined as it could be. The world building is interesting, if not quite as fleshed out as I wished it were. There have been on again and off again wars in this area for the past several generations. Land has moved from one nations hands to another in a near endless cycle. Though this is discussed, it isn’t discussed in any sort of detail perhaps halfway through the book. I sort of felt as if I were hanging, wanting more about this war, why it was started, and some information about the parties involved. Still, this is the first book of a series and with the focus so clearly placed on Josette and her new position, it isn’t of much surprise that certain aspects of the world weren’t delved into very deeply. This war is just one of many, but this one is different. Despite what some of the higher ups want the country to think, the war isn’t going well this time, putting the military in a rather delicate situation. Women are allowed in the military, but aren’t allowed to become captain of their own airships. Women aren’t even supposed to see battlefields. However, wartime has a way of doing away with arbitrary law out of necessity. Not only have women most definitely seen battles, something the main character makes obvious to the naïve, dandy nephew of the prominent general who wants to see her dismissed from her new post, but they don’t have a choice in the matter. Battles happen, and not always on the sort of tidy schedule that fits the war room’s maps and schemes. Politics and sexism are discussed in this novel. Some characters are incredibly sexist. Others support Josette quite staunchly. It is a very uphill battle she must fight, and I was interested in finding out how she handled the situation. While I liked Josette in the beginning, I found her a bit grating through much of the book. Despite being an excellent captain with good instincts, she never came across as particularly confident in herself. Very slowly this begins to change. Josette makes the decisions she needs to in order to protect and serve her country. The battles in this book were particularly fun. Great airships doing battle in the skies is always a treat. These felt very real. The danger of battle extended beyond being attacked, but extended to simply keeping the airship aloft, at the proper weight, and having nothing catch fire in the process. Shooting at the enemy was also portrayed as quite difficult. I really liked this about the book. It showed not only the difficulty of fighting in airships and how dangerous they are, but it also showed firsthand just how good Josette was as captain. I do wish that certain sections of the book went a bit deeper than they did. While the characters were generally likeable and had some great banter, I couldn’t help but wish that they had a bit more development. I wanted to learn more about them, get to know they better. However, it took most of the book to get through the three main character’s backgrounds let alone touch any sort of character development. The only one who had any obvious change or learned anything was Bernat. More importantly, perhaps, is the depth of the main plot. One of the top general’s in the Garnian Navy wants Josette out of the army simply because she is a woman. While this is understandable, especially with the rather sexist views the country has on women being in the army, it ignores other factors at play. Josette is shown to be a favorite of the people, having won over journalists who’ve reported on her death defying, battle winning exploits at the start of the novel. I expected a good deal of politics to be involved. However, that wasn’t necessarily the case. Things don’t progress much past the general’s single handed scheming, which seems odd considering the country is in the middle of a war they might not win and Josette is stated to be a favorite of the people. Still, this is the first book in a series, so perhaps a more involved look at the politics surrounding events will come to light later on. The characters were, largely, fun to read about. Out of all of the characters Bernat probably has the most character development. He goes from simply doing is uncle’s will to coming to respect Josette rather deeply. While I enjoyed sections from Bernat’s point of view, particularly closer to the end of the book, I can see some readers finding him rather grating. 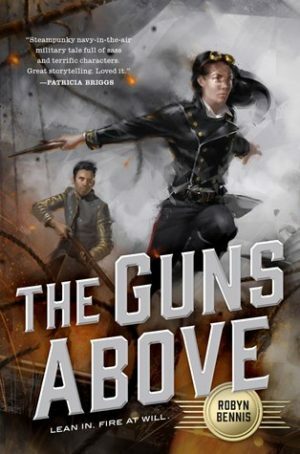 The Guns Above: A Signal Airship Novel by Robyn Bennis was an entertaining read featuring some truly exciting battle scenes. If you enjoy steampunk or stories of military science fiction this is a novel to check out.